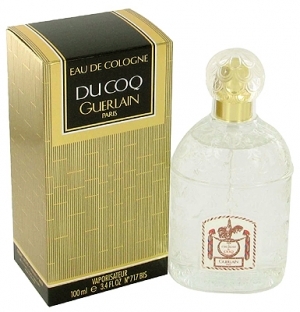 Eau de Cologne du Coq: is a citrus aromatic fragrance for men, launched in 1894. The nose behind this fragrance is Aime Guerlain. 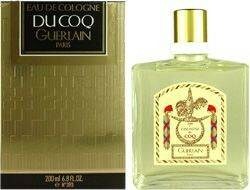 It was also known as "Eau du Coq". This was created for a friend of Aime's, the distinguished French actor Benoît-Constant Coquelin, , whose nickname was le Coq (the Fool (foolish but having the slyness of a rogue), or the little Rooster). "COQUELIN Constance Benoit b.1841. 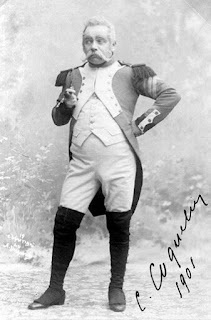 A distinguished French actor as Coquelin Aîné to differentiate him from younger brother Coquelin Cadet. Born Boulogne sur Mer January 23 1841 he showed such dramatic gifts that he was sent the Paris Conservatoire 1859. The year he took the second prize for comedy made his debut on the stage of the Comedie Francaise in Le depit amoureux. Later he with brilliant success in Le mariage Figaro, Le malade imaginaire, Le misanthrope, Le barbier de Seville and other pieces in classic repertoire In modern plays he was less effective and he speedily became a popular favorite His versatility is remarkable Among his creations have roles in Le lion amoureux Gringoire Paul Forestier, Les faux manages, Le monde ou s'ennuie and Denise to mention only a few had been elected a societaire in the Theatre Francais as early as 1864 but in 1880 he and made an extensive tour abroad. In 1888 visited America. At the end of 1889 he to the Theatre Francais where as a member of the company he remained till creating among other parts that of in Thermidor January 1891. In 1893-94 appeared again in the United States. His in 1895 at the Renaissance in Paris led to a lawsuit from the Comedie Francaise in which he was condemned to damages. In 1897 at the Porte Saint Martin produced Rostand's Cyrano de Bergerae has become his most celebrated character. 1899 came his Napoleon in Plus que reine 1900-01 he visited America once more this in company with Sarah Bernhardt to Due de Reichstadt he played Flambeau in L'Aiglon. M. Coquelin is known also a writer and lecturer among his being L'Art et le comedien 1880 which been translated into German and into as The Actor and His Art Les come par un come dien 1882 L'Arnolphe de 1882 and L'Art de dire le monologue in by his brother Coquelin Cadet 1884. " "To those who had followed the career of this comedian it was obvious that Cyrano de Bergerac had been written not only for Coquelin but around him in order to let him display in one many as possible of the facets genius already disclosed in a host plays It was equally evident Chantecler with all its lyric exuberance was also a play tailor made for comedian with the clarion voice could be both vivacious and pathetic is even possible that the first this barn yard fantasy may be found fact that the comedian was in habit of signing his notes to his intimates with the single syllable 'Coq' ." "L'Eau de Cologne du Coq a été spécialement étudiée par Guerlain pour la jeunesse sportive." So what does it smell like? It is classified as an aromatic citrus fragrance. Presented in the white bee flacon.